The old king of legend couldn’t control the waves with a flick of his hand, but you, his heirs, can master them with the power of your navy and the reach of your trade fleets. The destiny of millions is in your hand in Rule Britannia, the newest immersion pack for Paradox Development Studio’s classic historical strategy game Europa Universalis IV. Rule Britannia brings greater depth to the lands of England, Scotland and Ireland while offering tools that will deepen the experience of Europa Universalis IV no matter where you choose play. The mission system has been completely reorganized (with new unique missions for the British and Irish nations), and any nation with a fleet can choose a naval doctrine that will boost its galleys, reduce its maintenance cost or strengthen the power of its trading ships. If you are new to Europa Universalis follow this link to find out more about the game. These features are only available if the accompanying dlc is activated. 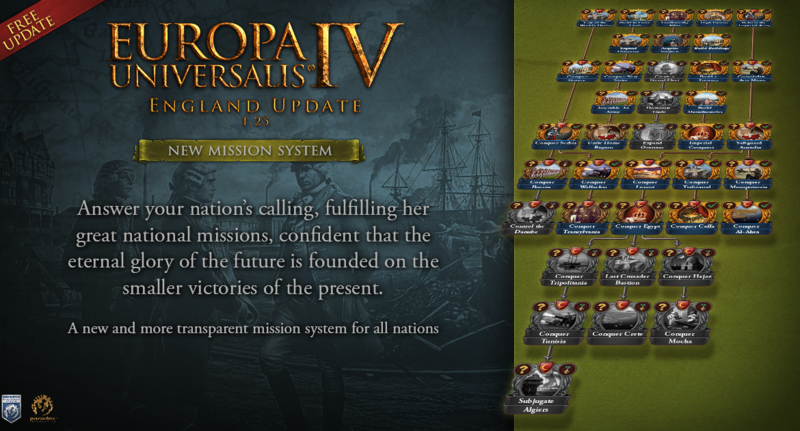 New British Missions: Exclusive Mission Trees for England, Scotland, Ireland and Great Britain, embedded in the new Europa Universalis IV mission system (coming with the 1.25 update). New Units: New army designs for British and Irish nations, including independent Northumberland and Cornwall. Trade Steering: Force your defeated enemies to have their merchants fill your coffers. Europa Universalis IV: Rule Britannia is now available in the Paradox store and on Steam for the suggested retail price of $9.99. These features will be added to the base game on the 1.25 patch meaning that they are free for all players and function without the need of the accompanying dlc. Reworked old mission system to mission trees. Expanded map of the British Isles, the Low Countries and northern France. Added new playable/revolter tags to the British Isles. Added new national ideas to British Isles and Low Countries. Click here to read the full patch notes of the England Update 1.25! – Nations now have an Innovativeness value, ranging from 0.0 to 100.0. – Knowledge Sharing lets you speed up the adoption of Institutions in the target country. – Naval Doctrine Wooden Wall now gives a combat roll bonus of 1 in neighboring coastal provinces. – Added Coal Trade Good. Trading in Coal gives 10% extra Goods Produced nationally. Local bonus is 20% State Maintenance reduction. – Added potential for Coal to a number of provinces worldwide. – Added Furnace Manufactory that boosts national goods produced by 5% instead of local produced goods. – The Steer Trade diplomatic action and peace treaty can be used to make merchants in the recipient country steer trade value towards your trade nodes. – Added 15 Anglican events, including DHE to convert to Anglicanism as a British-culture nation. – [Purple Phoenix] Updated the Purple Phoenix DLC for the new Mission System. – Lobby/Start Screen: Added news banner (shown first time game is started after an update with new news content). – Reworked how gold is demanded in peace offers: 5 war score now equal one loan size of target, and maximum WS on gold is 25. – Diversified SFX for Papacy-style interfaces. – Reduced most permanent sources of land maintenance cost reduction. – you no longer break alliance or support liberty relations when changing the religion. – It is no longer possible to Conform to template Condottieri (or pending Condottieri). – At most 25 war score can be demanded as gold in peace. – Tributary overlord is not called into independence wars between a tributary and his subject. Sukhothai rejoice! – Support independence is no longer canceled after one month if the overlord of the subject is a tributary. – To set Player attitude to Friendly towards a country now requires said country to have 50 opinion of player. – AI slightly more weights in neighbors that might declare on them in prewar power calculations. – AI will now consider giving provinces to subject in peace even if they have vital interest on them. – Made getting Friendly attitude from AI directly depend on opinion to a degree; this is an attempt to fix the bug that for unknown reasons made it very rare. – AI overlord cancelling Tributary relation or being cancelled by overlord will have -1000 towards acceptance for the duration of the opinion modifier. – Added explicit check to forbid AI from canceling Transfer trade power or Trade steering when an agreement to their benefit is in force, and they are not preparing war. – Fixed ruler personality induced war declaration disclosures and added this to Babbling Buffoon and Malevolent personalities as well. – Fixed AI acceptance modding for custom diplomatic actions. – AI will now use Statute in Restraint of Appeals decision under limited circumstances. AI with this decision active will never reject Anglicanism. – AI is now aware of more types of diplomatic expenses when performing budget calculations, hence less likely to underestimate budget. – Free Thinker and Scholar personality rulers are more likely to Knowledge share. – An AI country maxed out on tech will no longer try to advance to higher tech (this was reducing late game performance and preventing it from e.g. developing provinces instead). – AI is now more keen to repair unmothballed ships during peace if they have no loans. – Fixed AI increase in budget when rich, so it will spend more on army and navy if being very rich. – AI is now much more likely to build force limit buildings. – AI now deprioritizes building force limit/manpower/sailor buildings until they have built some economic buildings. – AI can now destroy buildings to build better ones if out of building slots when they are rich. – Mostly undid “AI prefers to siege with 1 or 2 regs above minimum of limit” change unless fort level is one. It caused other issues currently too complex for AI to deal with. – Capped number of days in a row an AI army will skip processing for during peace to 15 to avoid unresponsiveness when preparing war. – Fixed AI massing on borders before declaring war (for immersion), if there isn’t too high threat nearby. – Trimmed down number of independent AI armies for countries with many regiments as this was being a performance drain. – Tweaked non-tributary subjects declaring wars (colonial nations) to require a greater advantage, as to create fewer “overlord must rescue them” situations. – Fixed issue where AI wouldn’t merge many small transport fleets due to waiting for an admiral assignment it wouldn’t decide to make anyway. – AI made more likely to choose fort provinces as fleet bases to avoid easy capture. – Added guard against AI launching doom stacking invasions into one province islands that already have enough troops (this works for any friendly units already arrived). – AI will no longer use armies to explore when there are threats nearby said army. – AI can now split their transport fleet when they feel safe about doing so and army to be transported is smaller than fleet. – Fixed case where army would refuse to board transport because target location is held by enemy controller (really old code not making sense). – Fixed exploration nations’ AI splitting up most or all of their armies into 5k stacks due to reassigning conquistador. – AI should be slightly more proactive against transports landing troops on their home shores. – Fixed AI warship building; it can now build 5-10 times as large war fleets under favorable circumstances. – AI now keeps a home fleet consisting of warships that’s not allowed to stray far from their home coast. – Revised number of admirals the AI recruits. – AI no longer unassigns admiral from fleet as soon as it leaves port to another fleet in port. – AI considers maneuver more important than before when estimating navy power and admiral skill. – Reduced willingness of AI to suicide navies that would enter battle early with a way too powerful enemy fleet because of expecting reinforcements. – Probably fixed exiled armies with splinters stuck unable to reach their base due to gathering up. – Fixed cause of fleets stuck waiting for 0 unit armies. – AI will try to keep a minimum fraction of its armies at home rather than sending them abroad to fight. This is however constrained by its splitting logic. – Invading AI army stuck and unable to path to departure port will now disband. This is less bad than tying up a large part of the AI’s force (including freed splinters). – Tried to make AI less adamant about transporting troops to own areas with little actual military threat, as well as diverting troops from areas with significant actual threat. – AI slightly more likely to assign leaders to main armies rather than splinters, and especially than divisions. – AI can now simultaneously invade with multiple armies in same area provided there are enough enemies there (rather than exclusively with one army at a time). – Fixed major bug in region assignment system that made most assignments fantasy comparatively speaking. – Fixed invasion splinter consolidation behavior. – Tightened up AIs use of repairing fleets for transport (especially, it will no longer assign such a fleet and then let army sit frozen and wait for it to repair). – Revisited exploration logic to make it work as intended w.r.t. not using entire fleet for it. AI will also stop exploring during war properly. – AI regions are now different from geographic regions and are calculated to optimize AI, will hopefully help with idiot Mamluk AI. – Fixed crash caused by AI trying to raise janissaries in lost states. – Land/Navy force limit values/modifiers (considering local autonomy) are shown on map and macro builder selecting Regimental Camp and Shipyard. – Armies drilling around now have a very notable yellow “Drilling” in their tooltip. – When a human player is at war with another human player, a blue flame will now be shown in the outliner instead of the standard red. – Clicking on an achievement’s progress/requirements in the achievement browser will now highlight relevant provinces on the map that you need to fulfill the Achievement. – Clicking a decision requirement will now highlight relevant provinces on the map. – Added “innovativeness” console cmd. – Added “norevolts” console command. – Added “repair” [ships] console command. – Updated “economy” console command to also display AI budget. – Added “powerspend_count” console command. – Added “assert” console command to check trigger argument (if trigger evaluates false, test failure is invoked). – Added “change_innovativeness” effect (Country scope. Range [-100.0, 100.0], capped to [0.0, 100.0]). – Removed error logging of dynamic ( ex. [USER=1182520]@root[/USER] ) flags. – Fixed error log flooding of “undefined event target” when using global_event_target. – Added innovativeness static modifier. – Added the modifier type institution_growth. When applied to a province, it will grow all institution by this value, with special case handling for knowledge_sharing. – Added the province modifier knowledge_sharing added to any province where knowledge sharing is growing an institution. – Added “innovativeness” trigger (Country scope. Range: [0.0, 100.0]). – has_province_modifier trigger now supports triggered province modifiers (takes triggered province modifier trigger key, checks both active and non-active triggered modifiers). – Added has_active_triggered_province_modifier trigger (takes triggered province modifier trigger key). – Add number of consorts trigger. – Add captured ships with Boarding naval doctrine trigger. – Add island provinces trigger. – Added the define NDefines::NDiplomacy::PEACE_COST_GOLD_STEP to specify maximum number of loans worth of gold that can be taken from giver. – Changed the semantics of define PEACE_COST_GOLD_STEP to set WS per loan. – Added PEACE_COST_STEER_TRADE define to specify peace cost of the Steer trade peace option. – Added the define DIPLOMATIC_ACTION_KNOWLEDGE_SHARING_ACCEPTANCE_MULT to control AI’s tendency to use Knowledge Sharing based on acceptance. – Changed church aspect objects effect to be named modifier instead. – Added the defines KNOWLEDGE_SHARING_DURATION_YEARS and KNOWLEDGE_SHARING_COST_PERCENT_MONTHLY to control Knowledge Sharing. – Added define EXTRA_SURPLUS_WHEN_NEEDING_BUILDINGS for AI to make them save more money as long as they need to construct buildings. – Added INVADING_MIN_HOME_RATIO to specify minimum of armies AI should keep at home. – Added HOME_FLEET_MAX_RATIO to specify the upper limit number of warships AI should keep as a home fleet. – Added province highlighting for decisions. – Added decision to adopt Sikh Religion for Muslims. – Added option in Margaret of Anjou event to make her a consort. Event can no longer trigger if there is already a consort. – Cruelty of Mercenaries now requires at least 15 units of Mercenaries, rather than 1. – Added 22 events relating to the Industrial Revolution. – Added 1 price change event for Coal. – The event for Toyotomi Hideyoshi now lets you choose him as your heir. – Burgundian Ambition is now 15% Goods Produced. – Added province highlighting for missions. – Added Persian Missions. The Persian flavor events “Reforms of Ismail” and “The Shrine of Najaf” are now triggered through missions instead of mean time to happen. – Updated Missions for Portugal for the new Mission System. – Updated Missions for Austria for the new Mission System. – Updated Missions for Tirol and Styria for the new Mission System. – Updated Missions for the Ottoman Empire for the new Mission System. – Fleshed out Byzantine Mission to conquer Venice reward a bit. – Updated Base Game Missions for the Byzantines for the new Mission System. – Dijon is now an Inland Center of Trade. – János Hunyadi no longer treated as a regency. – Revamped areas a bit in Northern France and the Low Countries. – Split Bourgogne into Dijonnais and Auxerrois. – Removed Limburg Province and replaced it with Upper Guelders. Much of old Limburg now belongs to the province of Liege. – Added 4 provinces to Ireland. – Added 15 provinces to the Island of Great Britain. – Added 3 provinces to the Lowlands Region. – Added 8 provinces to the French Region. – Added Tyrconnell country tag Ireland. – Added Faly country tag in Ireland. – Added Ormond country tag in Ireland. – Added Munster (MacCarthy Mor) country tag in Ireland. – Added Mann revolter tag. – Added startup screens for Irish minors, Provence, Brittany, and Scotland. – You can now pick the Siberian Clan Council government in the Nation Designer. – You can no longer reinforce your armies for free by drilling them. – Added even more consistent coloring in tutorial overview. – Fixed bug in trade policy event 9 that would make it impossible to get new maps from it. – Fixed bad check in tribal federation event 6. – Breaking Vassalization is no longer limited to Art of War (clearly not WAD). – Fixed wrong primary culture for Hojo, Hosokawa and Tokugawa. – Fixed sound not playing when becoming Defender of the Faith for certain religions. – Fixed CTD when trying to move a trade end node in nudger. – Fixed minor heir name display bug. – Removed different religious school penalty when playing without CoC as it was inconsistent with DLC feature. – Fixed bug where subject wasn’t able to call its overlord into war when said overlord had warned other party, despite UI claiming otherwise. – Modding: Fixed trade routes no longer being written when using the nudge tool (broke in 1.23). – Modding: Fixed trade routes not showing when first opening the nudge tool. – Modding: Added info dialog when trying to select a Trade Node with no outgoing routes. – MP: Fixed banned players getting a message about being kicked instead of banned. – Fixed swapped option texts for Japanes flavor event 50, “A Son Finds His Way Home”. – Startup screen for Austria no longer makes claims about the ability of Albert the Magnanimous twice. – Fixed an event that could swap the religion of a province that had a Center of Reformation. – Fixed a bug where the Japanese Flavor Event “Silver Pavilion” could trigger in a province that already had a Cathedral. – Fixed freeze when having the same unit multiple times in province unit list. – Fixed CTD in ai_acceptance in custom diplomatic actions. – Fixed La Malinche’s distinct lack of culture. – Forming Japan now properly sets a flag so it cannot be recycled by the same country. – Local Institution spread no longer shown in national modifier view. – Grand Embassy event series should now be less confused about gender. – Fixed Timeline FoW exploit. – The Surrender of Maine event no longer refers to the wrong monarch taking matters into his own hands. – When a Center of Reformation is created, it will now automatically stop conversion by other Centers of Reformation. – Fixed CTD and added error log if trying to use add/remove_province_triggered_modifier with invalid modifier. – Fix the Declare War dialog: the overlord of colonial nations will not defend the colonial nation in case of war against other colonial nations or natives. – Fixed CTD when using the “run” console command with scripted triggers. – Fixed wrong scope for institution_events.26 MTTH. – Units can no longer be Conformed to Template while movement is locked. – Fixed so that you cannot refill garrisons unless they are controlled by you or a current war ally. – Hostile coring cost province modifier no longer disappears for annexed countries as long as they are the most “hostile coring costing” claim in the province. – Troop counts over 1 million in war overview now show with 2 decimals. – Troop counts in war overview are no longer hidden to observer. – Fixed the ability to create empty “ghost armies” when transporting across water via automatic transport missions. – Fixed crash when trying to build a manufactory locally in a province. – Fixed scoping bug for continent trigger in some trade policy events. – Fixed error when using the “cede_province = —” command. Home and Away: As Wales hold Cardiff, Dublin, Edinburgh, Rome, Paris and London. Sun Invasion: Own and have cores on Tepeacac, Mexico, Tullucan and Huastec as the Madyas. Sleepless in Seattle: Have your capital in 2485 (Chehalis) and own 10 Coffee producing provinces. Philippine Tiger: Recreate the Chola Empire as Cebu. Empire of Mann: As Mann, conquer all Islands in the world. Industrial Powerhouse: Have 10 Furnaces built in your nation. Chop Chop – Have 6 different consorts with one monarch. I'm Michael a variety streamer living in beautiful Bavaria, Germany. My games focus on Strategy and Rpg. I post my streaming times at the beginning of each week on my website. My streams are full of randomness, weird sounds and based on Lord of the Rings - so a "YOU SHALL NOT PASS" may happen any time! Streaming language is English and sometimes German.